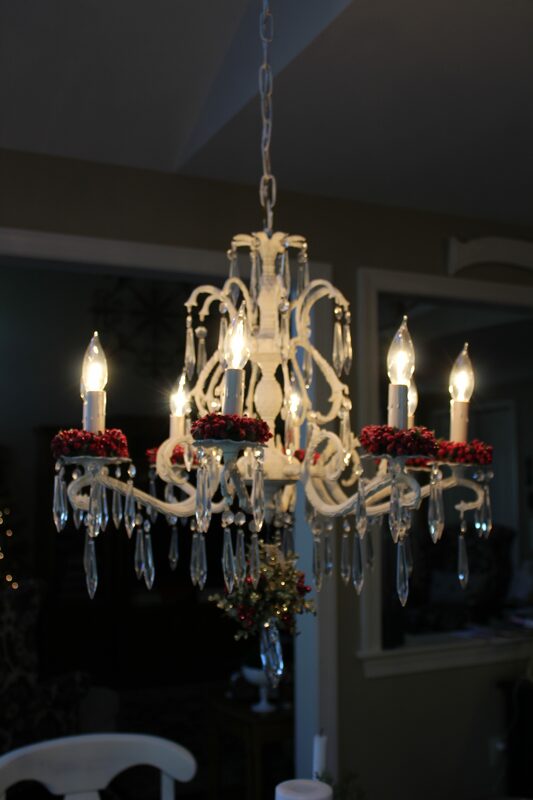 Home Antique of the Week	Chandelier Decorated for Christmas! Happy Tuesday! Tomorrow is the official start to winter but boy it is cold already! Today I thought I’d share how I decorate one of my chandeliers for Christmas. It is so easy and so pretty! Come see! And this is how I decorate it for Christmas! I bought eight red berry rings several years ago at a local lighting store. I love the bright red and the glitter on the berries with just a touch of green leaves peaking through. This year when I pulled them out of storage I noticed that some of the red had chipped off of the berries leaving chunks of white showing. NOT okay. So I pulled out my favorite red fingernail polish (OPI Red Hot Rio) and painted the white specks red again. It worked like a charm!! Once the fingernail polish was dry, I slipped each berry ring over the candle. So pretty and festive! Uh-oh, I see I missed a few sports! Better whip out the fingernail polish again! I temporarily replaced the bottom crystal with a huge crystal with mistletoe. I bought this several years ago at the Hallmark store. It easily attaches using an ornament hook. And here it is all dressed up and ready for Christmas! Frontgate Ladder and a Coupon Code!